While deep sea fishing in Miami, you can never rule out an encounter with a marlin. Blue and White Marlin swim the tropical Atlantic constantly searching for food. Offshore trolling for dolphin and kite fishing for sailfish are the best ways to run into a marlin. In the spring a small window of opportunity opens when White Marlin can be caught on the edge while kite fishing for sailfish. White marlin are often mixed in with packs of sailfish as both species share a similar niche. On banner sailfish days during spring, several shots at whites are not uncommon. The occasional rat blue may also crash the party. 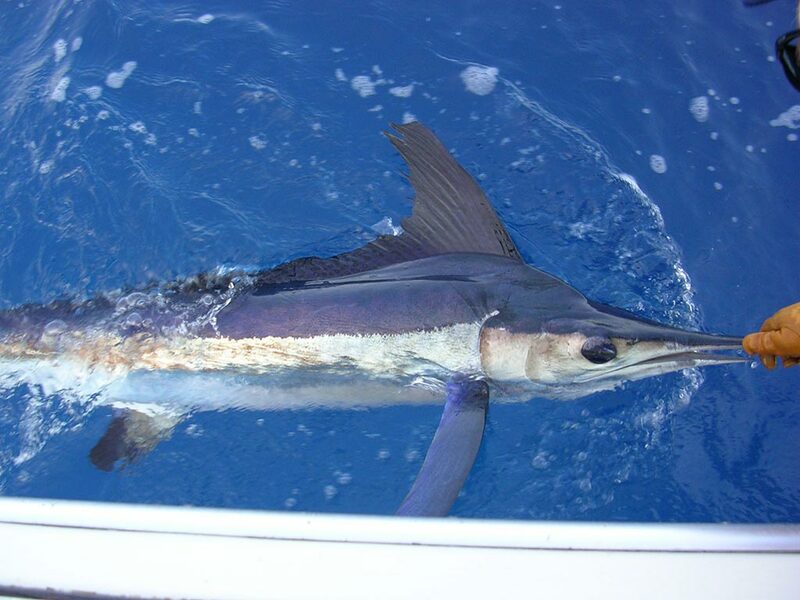 White Marlin are significantly smaller than Blues, rarely reaching more than 100lbs. They are finicky eaters but brutal fighters. In seconds they'll switch from jumping all over the place to slugging it out in deeper waters. As the water warms, blue marlin can be found chasing schools of pelagic species and will crash the party when trolling for dolphin. Fishing for Blue Marlin in Miami is most productive around the full Moon. Focus your efforts on the humps and canyons in the Gulf Stream. Trolling a flashy spread with dredges and teasers can help increase the odds of raising a marlin, but catching them is still quite a challenge. Blue Marlin can reach weights of 1000lbs, though blue marlin off Miami generally are less than 500lbs. Double Threat Fishing Charters keeps a large 50w setup rigged and ready if the opportunity to catch a Blue Marlin presents itself. Otherwise, our kite fishing gear will suffice for smaller whites and blues. With wild acrobatics and ridiculous strength, Marlin are an unforgettable species when dealt with. There are no fences in our oceans so running into one is always a possibility.